If you ask me run a small business alone, I can tell you I will fail. Simply because I don’t have a proper management skill to handle all these. I need a management person to assist me. And this person will be my hubby. He is very good at this. He indirectly me helping me setting up my online sewing business. Now I can run my business smoothly but I still need his advice from time to time. If he does not help me, then maybe I will need to find workflow software solutions to guide me already. But before using the software, I have to study first. To study whether it suitable for my small business or not. One of my friends told me that her SIL likes to watch Youtube very much. She can watch the channel all day long. I am surprise her toddler son never disturb her while she is watching any video clip. Her son can entertain himself while the mom watches the video clip alone. How nice if my girl can behave like that too? But I am watching video lar, I am doing my sewing only. It had been raining almost everyday now. Morning hot like hell, come to 3-4pm, the day start grooming and will rain anytime. You better standby bigger umbrella in your office or car because the rain is real heavy type. Sometimes I even cannot see properly when I was driving. Long school breaks coming soon. We plan going to Penang during Hubby’s company shut down week. He will be very free then, so I took the chance to persuade him to go Penang. I had booked the hotel, next is to plan the itinerary. Frankly I do not know where to go yet, but definitely will meet my course mate there. Of course will not miss out to eat my favorite cendol, asam laksa, fried kuey tiaw etc…. One of my close friends going to move to her new house before Christmas. I am still thinking what to buy for her as housewarming gift. I have been shop online to look for suitable but till now still fail to get anything for her. But I was told she not yet done her curtains for the house, therefore I decided to sew some matching window toppers for her. Quite a good idea, right? I know I got no time to sew whole house curtain for her, so window toppers is the best choice since it is quite easy to sew it. My sister and her boys will be in town too, so we plan to go some where else. Most likely we will go to beach or pool side to enjoy the dip since weather nowadays is so hot!! Most of the time when I was in shopping mall, I would love to see their store display. If the mall hire creative display designer, I am sure they can help the mall to get more sales and customers. A creative display can draw the customer in and boost up the sales indirectly. Nowadays many malls will present their best store display for some seasons, such as Chinese New Year, Hari Raya, Mooncake Festival, Christmas etc. We as consumers usually can just do window shopping at the shopping mall by seeing all these nice decor. My girls dislike exam, their mummy also don't like. They never talk initiative to do revision one, so their mummy have to shout at her lung out to remind them to do revision. Many times the poor mummy get scolded by them too, especially from the second girl. *Sigh* not easy to become mummy I tell you. Hey, come on lar, they already not worry, why should I? Zero fare is back on 18/09. Am I able to grab some tickets for my family members? I don't know. Whenever come to this kind of event, the web is jam and congested...very hard to login and book any ticket too. Anyway, I may try my luck too! Yeah, finally my long awaited vacation is coming soon. Although the girls have to skip class for 2 days (very reluctant though) but I know they also looking forward this vacation. Hopefully the weather is good, so that all of us can enjoy the trip fullest!! A cigar is not a cheap stuff. I also have the thinking that only rich people afford to take cigars. Ordinary people like me will never have chance to try it. My former boss likes to have cigars and he is a very young businessman. Usually only those middle age businessman like to have cigars. Well, to be frank, I dislike the smell of cigars, same goes to cigarette smell too. But my former boss told me some cigars have nice smell too. I wonder what is the smell of baccarat cigars now. I am envy one of my colleague now. She went to travel almost every month since 3 months ago. Though it is only short trip to nearby country but the main thing that attracted me is she able to fly with her hubby, without her kids tag along. Wow, wonder when can I have such chance??!! Nowadays the kids are so lucky. Whatever they want, their parent will try to fulfill their wish. This is because parent nowadays are having quite good life, so they will let their kids to enjoy life as well. Many of the primary school kids owning a mobile phone too. Some even own ipad or iphone too. However my children do not have such luxury life like their peeps in school. My hubby does not want them to have such luxury gadget at such young age first. He wants them to learn to earn and buy for themselves if possible. Lately I heard there are prepaid debit cards for kids too. So that the kids can spend using the card. Whenever the amount becomes minimum, the parent will top up for them. How lucky they are, don’t you think so? If you wish to get free prepaid debit cards for kids too, simply check it out from internet, I am sure you can get lot of information for this service. Ok, finally settle the order in hands, now I can concentrate in sewing one set of baju kurung for myself. Yeah!! I had bought the fabric long time ago. Each time when I plan to start the sewing, I will have some orders coming in. Hopefully this time I manage to finish my own baju kurung, then only the new order the coming in lar! 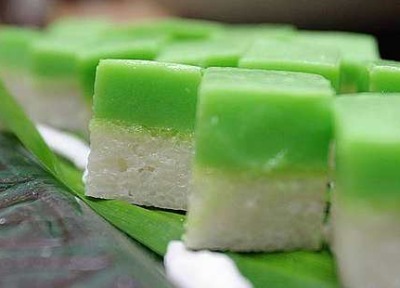 Seri Muka is one of my childhood favorite Malay kuih. I will buy it whenever I saw it in stall. Now my girls also love this kuih. They will beg me to buy for them for tea time. However not all stall’s Seri Muka are nice. Now I can get the recipe easily from internet, so one day I may try to make it myself. Hopefully the result turns out good. This year the Hari Raya festival fall within school term break. It is on 19/08 - 20/08. As usual we did not plan to go anywhere during the peak season. What's more now my hubby was in China for his business trip. But I will try my best to bring my girls to have some fun without hubby present. So that they will not just wasted their holiday for just staying home. Wishing all my Muslims friends & colleagues have a blessed Hari Raya Aidilfitri festive! I think my hubby certainly does not need any ambien to help him fall asleep. Usually when both of us go to bed together, within 5 minutes I can hear him start snoring away. So you can imagine how tire he is during day time. Of course his snoring will insult me indirectly but I still did not purposely wake him up. I just let him be because he need more rest than me. Poor hubby, I know you work hard for our family. I love you! Hey folks, great news here. Baskin Robin still giving away free scoop of ice cream despite our Dato LCW fail to grab GOLD in Olympics 2012. you can redeem your free ice cream by 08/08/2012, 8.00 – 10.00pm at all BR outlet, terms and conditions apply. Too bad, I could not go as dragging with 3 kids is impossible to beat the super long queue! Have fun you guys! There are plenty of providers that can provide you general liability insurance quotes nowadays. You no need to meet them personally in order to get the quotes. You can just check out the rates from their website and compare one by one too. Alternatively you also can read some consumers’ review before making any decision of your purchase. Once you have some guidelines another their calculation of insurance quotes, then only you can compare one plan with another easily. Nowadays it is so much easier to get some structured settlement quote from those agency. We just need to click for search in internet, and then you can get lot of settlement quotes within a minute. Unlike previously we have to call the agent one by one and compare the quote one by one too. It is very time consuming during olden days too. My 3rd princess yet to purchase any insurance plans, I better stay doing the shopping now, so that to cover her education as well as health plan. My little princess, Nice getting very active lately. She is very busy at home now, keep walking here and there. She is also keep asking for food from her two sisters or grandmother. Other than food, her other activity is watching VCD or DVD. Her favorite DVD is Colors, Left Brain and Right Brain Learning. She loves to watch animals characters DVD too. Sooner or later I think we need to buy extra dvd cabinets for her collection already. All the DVD has to keep properly, other wise this little girl will take out and play as her toys! Frankly I really no idea what is the term name of spring pin. When the guy told me he needs it for machine tension purposes, I was blur. So I pass this job to my hubby, let him settle it with the mechanical guy. My next door neighbour currently renovated their house. The house was fully demolished and rebuild now. So you can imagine how much they have to spend for it. Well, they are from wealthy family, so money is not a problem to them. it is more than 3 months already but the house still yet to complete. I was told they are going to build an outdoor fountains right in front of their car porch. Usually for Chinese, fountain is a good sign, mean to bring more wealth to them. Therefore they are willing to spend for it too. I wonder how much they are going to spend for it now. Recently I missed out some of the paid post, main reason was due to my laziness. I know it is free income but I just too plain lazy to login and start writing it. Hmmm...I should not behave like that, right? Since it is free income, I should appreciate it. Later part, I can use it as travel fund too!! Right now, I am going to shop for wine for my father in law. His birthday is around the corner and he loves wine a lot too. Most likely I will order the wine gift basket at GiftBaskets.com since the web having great sale now. If you also a wine lover, do check out the shop now! To be frank, so far I only buy my working clothing during sale. Yes, during sales. Meaning that during non sale period, I will only do window shopping but NEVER buy any single cloth. Therefore you can concluded that in my wardrobe all are discounted clothing including cheap womens coats. Other than shop for sale clothing, I only once in a blue moon, I will DIY my dress or shirt. I will only DIY when I managed to steal time while all my kids are asleep. I love to sew but my concern is I don’t have sufficient time to do so. This is also one of the reason I will buy bulk during sales period.